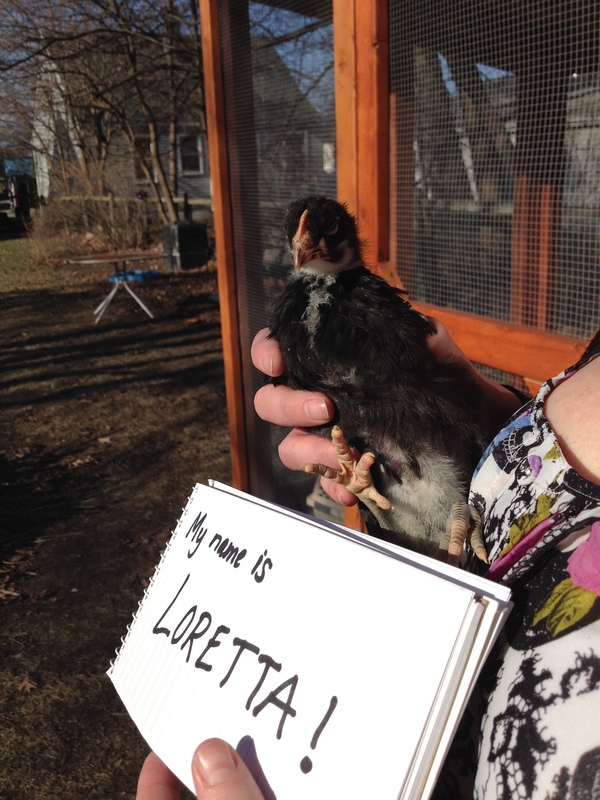 The votes were flying in, and we finally have a name for our Black French Copper Marans. This name, nominated by Kerry Hamilton Smith, won handily with 26 percent of the votes. Three names tied for second place, each taking 13 percent of the vote: Kentucky F. Chicken, Nellie and Pipsqueak. Great thanks to everyone who suggested fabulous names, and who took the time to vote in our poll. Most of all, a little black bird is extremely grateful. Loretta the Setta is strutting her stuff. Charlie and Baby Girl go nose to beak. With temperatures topping 70 degrees, we have been bringing the chicks out to the big coop for some outside time. At first, they huddled together under the ramp, but they quickly grew curious. They fully flapped their new wings for the first time, taking flight across the run. They ate gravel by the beakful, and managed to knock over their baby waterer in the excitement. 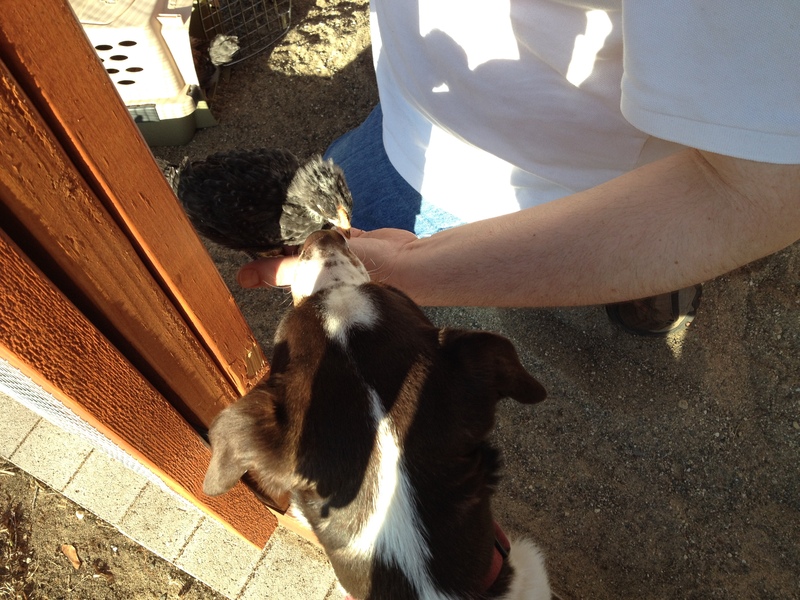 Today we saw Gigi attempt to take her first dirt bath, which chickens do to keep their feathers clean. She also led the crew over to the ramp, and climbed up a few rungs to show them how it’s done. Baby Girl was intrigued, and tried it out on her own, stopping just long enough to poop on the second rung. I also opened the run door and allowed Charlie to watch the chickens without a barrier. He was calm, and listened well. Matt picked up Baby Girl into his hand, and allowed Charlie to sniff her. It was a gentle affair; no whining, no shaking, no licking his chops. This all is great progress. Before we know it, Charlie will be cuddling with the chickens. And soon, the birds will be big enough that they can hold their own against our 24-toed cat, Cora. ← Top 10 chick names: The final vote!! Yea! That was the one I voted for. We’re planning our coop now with the hopes of getting our chickens in September in Georgia. I plan on naming them after country singers, Loretta Lynn, Reba Mcentire, Trisha Yearwood and one named after my cousin, Miss Betty! We can only have 4 in our county. Fortunately, we don’t need a building permit since it’s under 120 sq ft! Enjoy you chicks! Thanks so much! I was pleasantly surprised by the name, and absolutely love it. It suits her well!